Home > Members > Subscriptions > How do I add a new member? Click on the Member icon from the sidebar menu. Below the Accounts header, click the +Member button. A new member page will open up. Fill in all fields. If the member does not have an email address, enter a dummy email address according to this format: membername@farmname.com. Save changes. You will be directed to the Subscription tab of the member's new account. Click the Edit button in the upper right hand corner. Add the member's pickup location first. 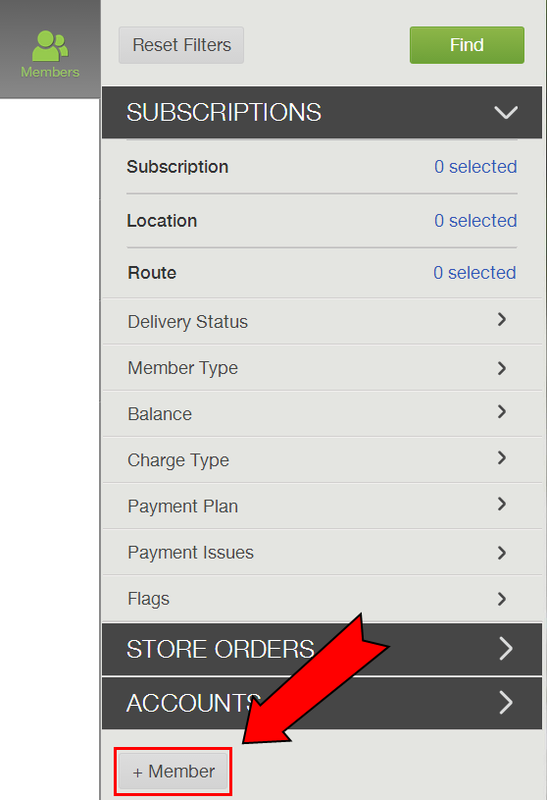 To do this, click the Edit button next to Location under the Delivery & Payment Preferences Section. Once you have added the location, click +Share in the Subscriptions Section. Select the subscription and schedule you would like the member to have and click Add. Once the location and subscription is added click Save in the upper right hand corner. All members added through your dashboard are automatically assigned the temporary password: farmfresh. Once you setup a member's account you should email them to instruct them how to sign-in to their account. To email a member, click the Send button in the upper right hand corner of their Member Page. We have created an online account for you where you can view and manage your subscription with us.